No matter how fantastic trekking in Nepal is, I consider it to be my duty to tell you more about high altitude sickness, because only by knowing your enemy can you protect yourself from it. In preparing to go trekking in the Himalayas of Nepal where the altitude of many trekking routes reaches 5,000 -5,700 meters above sea level, while trekking summits are located at altitudes of 6,100 -6,400 meters, it’s important that you’re aware of the possible physical risks and know how to recognize the symptoms of high altitude sickness, as well as ways how to “treat” this potentially serious ailment. So what is high altitude sickness and how does it manifest itself? Called also Mountain Sickness, Acute Mountain Sickness (AMS) or Altitude Illness is the human body’s reaction to atmospheric pressure and a reduction of the concentration of oxygen present in the air. As you climb higher into the mountains, your body gradually adapts to the reduced amount of oxygen in the air. The appearance of high altitude sickness symptoms shows that your body has increased its altitude level faster than it can acclimatize to the corresponding change in atmospheric pressure and reduction in oxygen. In trekking, altitude acclimatization processes are different for each trekker. 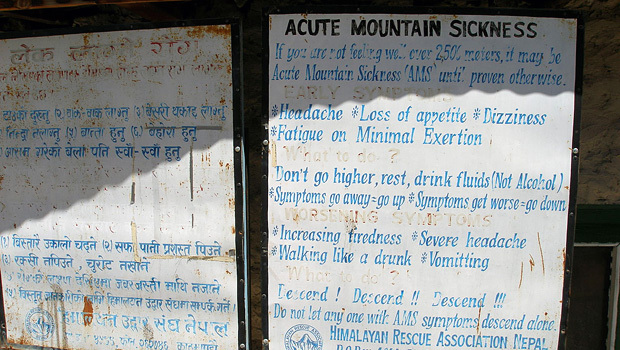 Whilst trekking in Nepal anyone can fall ill with high altitude sickness regardless of their body shape, experience and previous mountain trekking experience. There’s no need to fear high altitude sickness, but it’s very important that you know how to avoid it, how to recognize it and how to act correctly in the event that you encounter symptoms of altitude sickness. In rare cases, symptoms of high altitude sickness may begin to appear starting from 2,400 meters above sea level, but an increased risk of high altitude sickness sets in starting from the 3,300 – 3,500 meter mark. The high risk or mountain zone starts from 5,500 meters. This is why mountain airports in Nepal like Lukla and Jomsom are located at an altitude of 2,700 -2,900 meters. At altitudes above 3,000 meters, headache, dizziness, nausea, vomiting and shallow breath must be considered to be symptoms of high altitude sickness with the exception of cases in which there is another genuinely objective reason for these symptoms that is related to the trekker’s state of health before going trekking. High altitude sickness can develop in two serious forms: High Altitude Pulmonary Edema (HAPE) or High Altitude Cerebral Edema (HACE). It is also possible for both forms to develop. HAPE is considered to be less dangerous, because it develops more slowly, but it is more common for trekkers to fall ill with it: it affects up to 9% of trekkers in the Himalayas of Nepal. HACE is more dangerous, because it develops more quickly, but fortunately more rarely affecting only up to 1% of trekkers in the Himalayas of Nepal. The source of this data is the Himalaya Rescue Association (HRA). The mechanism of High Altitude Pulmonary Edema is as follows: as atmospheric pressure falls, the water in the body’s cells begins to flow into the pulmonary alveoli and gradually fills them. As a result the effective surface of the lungs gets smaller, your breath becomes shallower and begins to gurgle, and the slightest exertion makes you feel tired. In the case of High Altitude Cerebral Edema, fluid builds up in the areas around the brain. Mild altitude sickness symptoms are experienced by about up to 20% of trekkers at altitudes of up to 3,000 meters above sea level. HAPE usually gets worse on the second night after to ascent to a new altitude and the most frequent victims are young, trained climbers and trekkers. HAPE is accentuated by overexertion and cooling of the body. Moreover, this often begins at night and becomes more acute during physical exertion. Serious cases of HAPE are often also accompanied by HACE due to the rapid reduction in the quantity of oxygen in the blood to which the body responds in a similar way to how it responds to a rapid increase in altitude. The best means of preventing High Altitude Pulmonary Edema is to descend without delay by at least 500 – 1,000 meters in altitude or at least to the previous altitude at which there were no HAPE symptoms. If possible, the evacuation must be continued until there is a visible improvement in the condition of the victim. At this altitude the trekker suffering from HAPE should rest for a day or two and should only go higher when the symptoms of HAPE have completely disappeared. Descending to a lower altitude prevents additional formation of liquid in the lungs and the existing liquid begins to disappear through breathing induced ventilation. The most effective means of treating HAPE are a rapid reduction in altitude, rest, additional oxygen and consumption of liquids. In serious cases trekkers must take 10 – 20 mg of the most important medicine for HAPE, Nifedipine (alternatively known under the names Procardia, Adalat, Apo-Nifed, Nifedical, Novo-Nifedin, Nu-Nifed) every 8 hours. You can also get by with Acetazolamide (Diamox), Salmeterol, Sildenafil (Viagra) or Tadalafil (Cialis). Nifedipine, Acetazolamide (Diamox), Sildenafil/Tadalafil reduce pulmonary hypertension, but it is dangerous to use these medicines without proper medical supervision. Salmeterol is widely used in the treatment of asthma and helps the body to effectively absorb the liquid from High Altitude Pulmonary Edema. If available, providing the victim of high altitude sickness with supplementary oxygen can also produce a good effect if administered in the amount of 4 – 6 liters per minute. One should bear in mind that the majority of the items mentioned above are prescription medicines and they must be obtained in good time before trekking, because along trekking routes they can only be obtained from doctors at specialized HRA help points that are usually located at about the midpoint of the most popular trekking routes in Nepal at an altitude of approximately 4,500 m. On the Everest Base Camp trek one is located is Pheriche (4,400 m), while on the Gokyo trek a help point is located at Machermo (4,400 m). One should remember that High Altitude Pulmonary Edema can be confused with a mountain cough and bronchitis, both of which are characterized by a persistent cough with or without coughing up mucus, however if you are suffering from a mountain cough or bronchitis there is no shortness of breath whilst at rest and no feeling of acute lethargy. You can test coordination with the help of a simple test: draw a straight line along which the victim must walk with hands stretched out to the sides placing his feet heel to toe (drunk test). If the trekker cannot walk in a straight line and has difficulty maintaining his balance, falls and cannot get up without assistance, there are serious grounds for suspecting that he’s fallen victim to the most serious form of high altitude sickness: High Altitude Cerebral Edema. HACE is the most dangerous form of high altitude sickness. It progresses rapidly and requires quick action to prevent the trekker’s death. You may only have a few hours time to successfully implement rescue measures depending on the degree of seriousness of HACE. In a case of HACE, the trekker must DESCEND immediately by at least 700 – 1,000 meters in altitude without waiting for morning! Unfortunately, HACE often gets worse during the night when the body’s activity and breathing are less active. If immediate isn’t possible; you must use a special compression bag: Gamow Bag that generates an effect equivalent to a reduction in altitude. Undue delay can result in the death of the trekker suffering from High Altitude Cerebral Edema! Upon noticing the symptoms of HACE, you must immediately begin to organize rescuers, porters and everything else required for evacuation. If available, supplementary oxygen must be administered to the sick trekker as well as the following medicines: Dexametazon (also available under the following names: Decadron, Dexamethasone Intensol, Hexadrol, Dexacort Phosphate, Dalalone, Solurex, Decaject, Dalalon, Dexacen-4, Dalalone, Decaject, Solurex, Adrenocot, Dexasone, Dexone, Primethasone, Dexacorten, Medidex, and Baycadron). Dexamethasone can completely remove the symptoms of high altitude sickness in a few hours, but it does not help you acclimatize. If you use Dexamethasone to treat high altitude sickness you should not trek higher until the next day, to be sure the medication has worn off and is not hiding a lack of acclimatization. Side effects include euphoria in some people, trouble sleeping, and an increased blood sugar level in diabetics. For treatment of high altitude sickness: Two doses of 4 mg, 6 hours apart. This can be given orally, or by an injection if the patient is vomiting. Children may be given 1 mg/kg of body weight, up to 4 mg maximum; a second dose is given in 6 hours. Do not ascend until at least 12 hours after the last dose, and then only if there are no symptoms of high altitude sickness. High altitude sickness symptoms resolve very rapidly (minutes) on moderate-flow oxygen (2-4 liters per minute, by nasal cannula). There may be rebound symptoms if the duration of therapy is inadequate – several hours of treatment may be needed. In most high altitude environments, oxygen is a precious commodity, and as such is usually reserved for more serious cases of HACE and HAPE. Treatment in a portable hyperbaric bag (Hyperbaric Chamber, Gamow bag) is essentially equivalent to descent or treatment with oxygen; the trekkerheitil is inside a pressurized bag breathing an atmosphere equivalent to a much lower altitude. High altitude sickness symptoms rapidly resolve (minutes), but may recur if treatment is too short – at least two hours are needed. Dexamethasone works as well, though not quite as fast, is much cheaper, and far less labor-intensive than hyperbaric therapy. Hyperbaric treatment is usually reserved for more serious cases such as HACE and HAPE. In most cases the trekker who has fallen ill will survive and make a full recovery if he quickly descends to as low an altitude as possible. The drunken gait is likely to remain for a few days after his descent to safety. Once the symptoms of HACE have passed completely, the trekker can once again ascend into the mountains. I understand that high altitude sickness is a heavy and unpleasant subject, but I’m convinced that this knowledge will help every trekker to understand his state of well-being in the mountains, to avoid unnecessary risks and to stay in good health while trekking in Nepal. If you have any specific questions about high altitude sickness along Nepal’s trekking routes, please feel free to write to me and I’ll get back to you as soon as I can.